Tuffy says: Aledoca is SOLD. A beautiful and correct bay filly sired by the great Aledoc and out of our San Peppy grand daughter. I think this is the only filly her dam has produced. 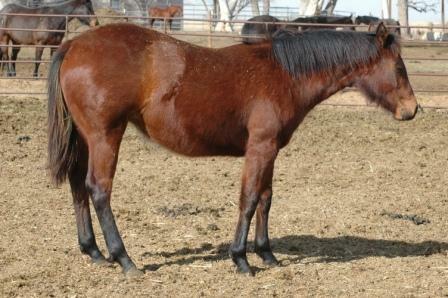 We have decided to keep this filly as a future broodmare. It is to hard to find such a great filly as this so we are just going to keep her here. THANK YOU RAYMUNDO ON THE PURCHASE OF THIS INCREDIBLE FILLY! WE WANTED TO KEEP HER BUT YOU WANTED HER MORE! THANKS AGAIN!